Geometry (or counting geometry) defines the source/container holder (support), and additional absorbing layers (if any). Radioactive sources are usually positioned on some sort of a holder which ensures that the source remains in a set position versus the detector during the measurement. It is important to specify this precisely, including any other absorbing layer between the source and the detector. In Angle you can define an unlimited number of geometries. If there is no holder and there are no additional absorbing layers (e.g. the source/container is placed directly on the detector end-cap), you do not need to specify the geometry data. 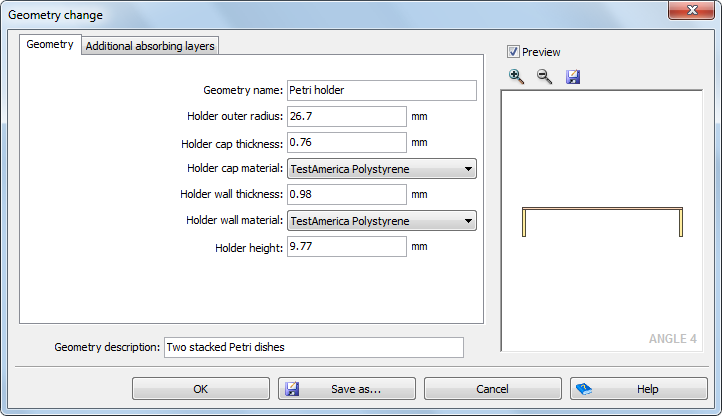 Instead, simply choose the option “No holder” in the “Geometry” box on the main screen. All your geometries will be displayed in an alphabetically sorted list. 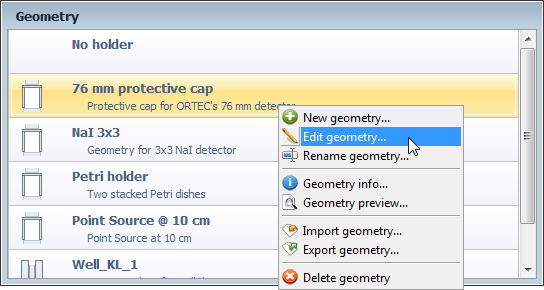 The options for geometry manipulation are located in the “Geometry” tab on the ribbon. The alternative way is to use the pop-up menu with the same options, which you can open by right-clicking the list of geometries. 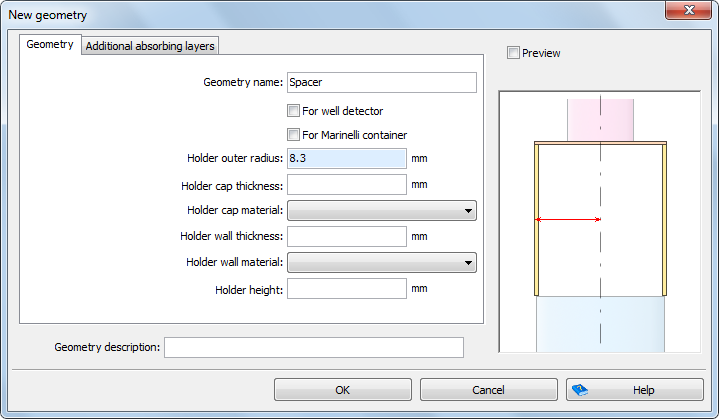 First, you will have to enter the geometry name and to choose whether the geometry refers to a Well detector or Marinelli container, or not. In case you mark one of these two options, you will not be offered the opportunity to enter the data for the holder, but will be able to specify the additional absorbing layers. The next figure shows the geometry data entry window, with the preview image on the right-hand side and the dimension line indicating the parameter being edited (holder outer radius). Additional absorbing layers (between the detector and the source) could be, for instance, thin protective plastic foils. 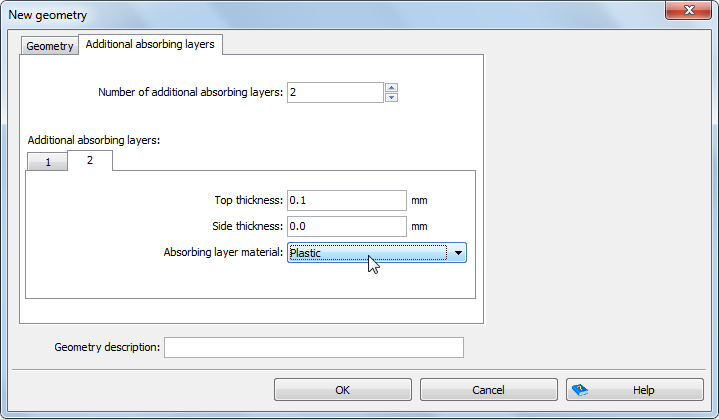 You can enter up to five additional absorbing layers. For each of them you can define its top and side thickness and material separately. Above the illustration you can find a “Preview” combo box. You can use it to see the scaled preview, instead of the generic illustration. The image is proportional, which is useful for detecting any obvious mistakes in the parameters, which would otherwise be hard to detect.